Now clearing at 75% OFF the original price! XL50 Pleat is from Europe and comes in a stunning range colours and textures to complement any home. A large 50mm Pleat makes this unlike anything you have seen before! 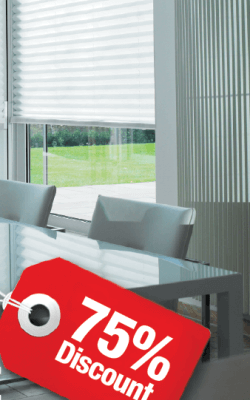 Blinds on the Net has bought all remaining stock of this state of the art blind and is now selling them for a ridiculous 75% Off the original retail prices. Unlike other Pleated blinds the XL50 Pleat features a clever ladder tape that holds the pleats in place so they remain permanently in place and won't drop over time. Head and Base rails are white in colour. Please allow approximately 3 weeks production time (at normal times of the year). Blinds On The Net are expert suppliers of both ready-made and custom pleated cellular and honeycomb blinds, with an extensive range to choose from online. We offer the best pleated blinds due to our high quality and discounted prices. We also stock a large range of aluminium venetian blinds as well as panel blinds and vertical blinds.